Finard Coventry Hotel Management has closed on its $16 million purchase of the historic Providence Biltmore, a landmark 292-room hotel located in the heart of downtown. The new ownership represents the next chapter for this storied property, originally constructed in 1922 and placed on the National Preservation Register. The Providence Biltmore, now affiliated with Preferred Hotels and Resorts, will remain open during a planned $10 million-plus renovation. The hotel’s new ownership and resulting improvements are expected to boost local employment. The Providence Biltmore currently employs a staff of 179 full- and part-time workers. Projections cite the creation of up to 29 additional permanent, full-time jobs at the hotel and dozens of temporary jobs during the renovation process. The Providence Biltmore comprises 292 guestrooms; 19,000 sq. ft. of function space, including 18 meeting and banquet rooms and a rooftop grand ballroom that is home to more than 75 weddings per year and many notable events. Guests may also enjoy The Spa at The Providence Biltmore, a luxurious spa retreat perfect for destination spa visits, day-spa use, bridal services or simply as an escape after a day of meetings. The hotel is home to McCormick and Schmick’s Seafood Restaurant and a Starbucks, located within the lobby. Other amenities include business center, fitness center, WI-FI Internet access, in-room cable TVs, and valet parking. 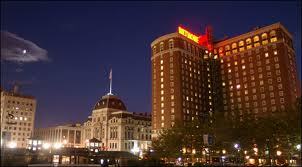 The Providence Biltmore is located at 11 Dorrance Street, Providence, Rhode Island 02903. For more information about the hotel, visit online at www.providencebiltmore.com. For reservations, call toll-free 800.294.7709.